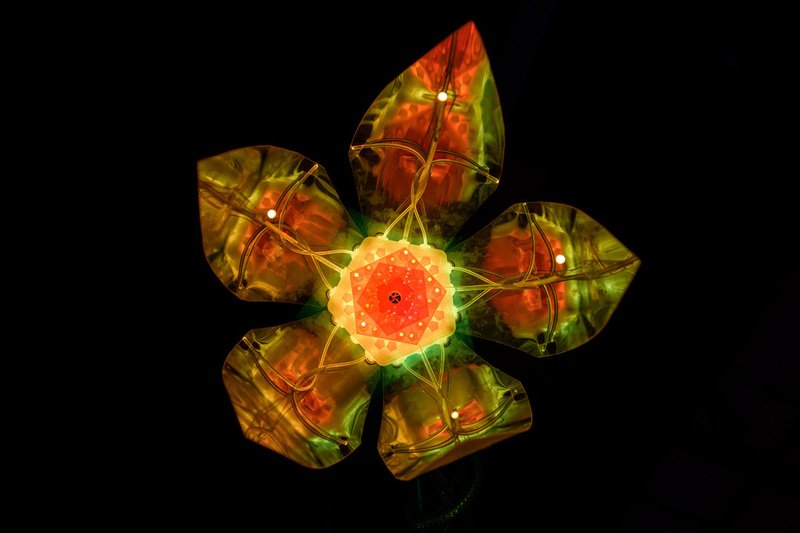 Three-foot diameter (when open), large robotic flower constructed entirely out of laser cut components. 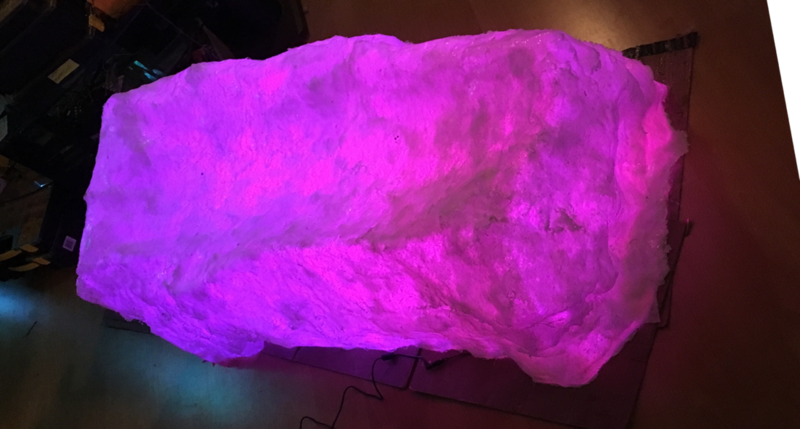 Large, fiberglass rock seat and bench illuminated with interactive LED lights. 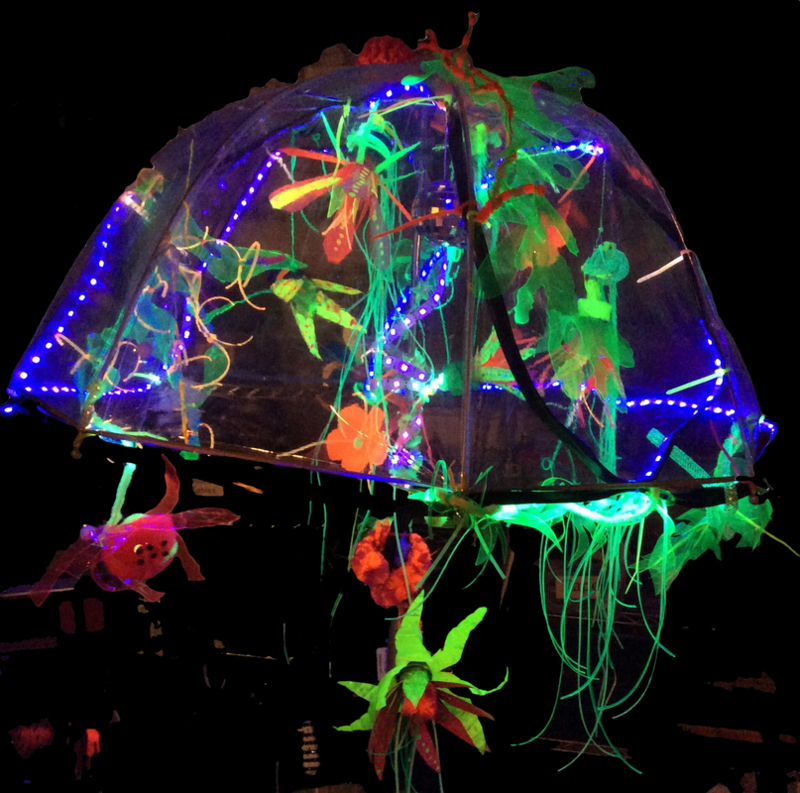 Biofeedback-based public art installation. 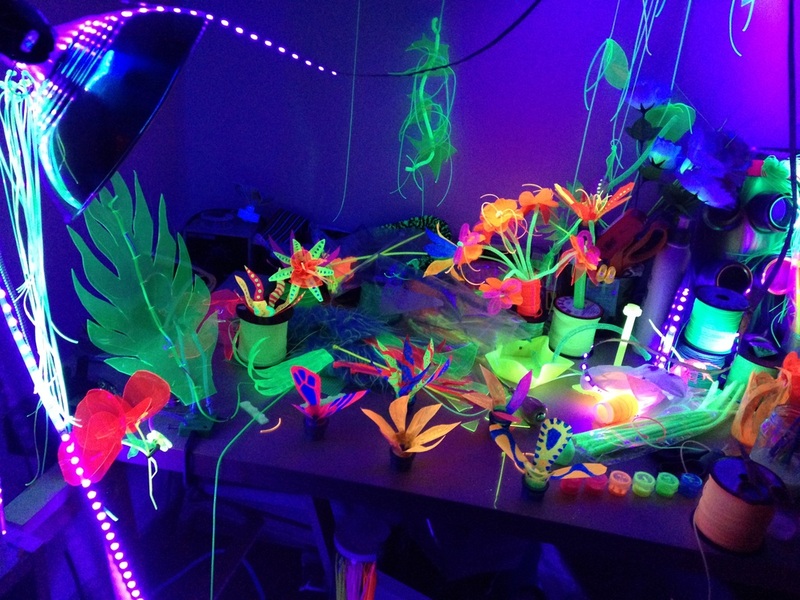 Flowers controlled by brainwave (EEG) data and heart rate date. 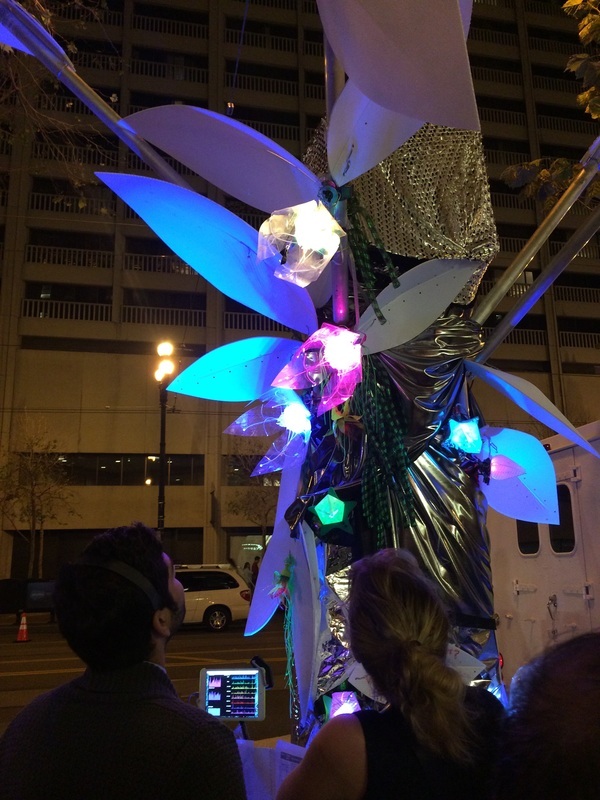 Installed for three days on Market Street in San Francisco as part of the Market Street Prototyping Festival. 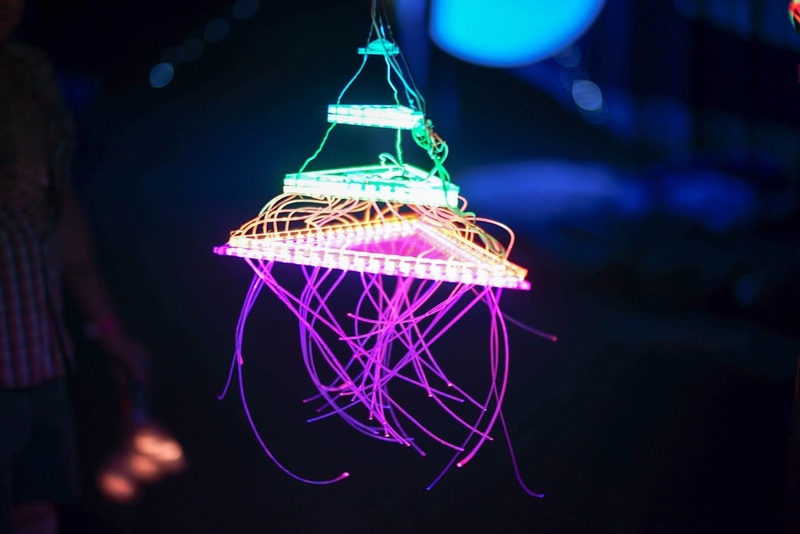 LED chandelier created with laser-cut acrylic, programmable LEDs, fiber optics, and Arduino. 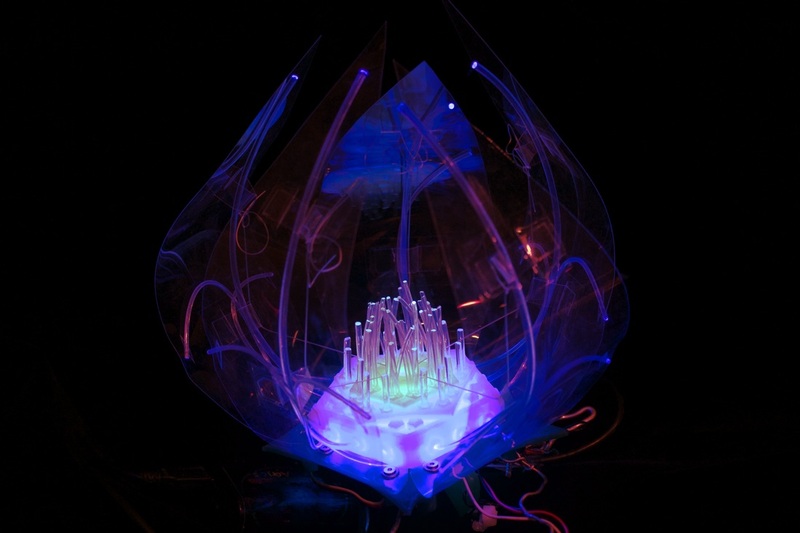 Controllable with bluetooth iOS app or standalone mode. 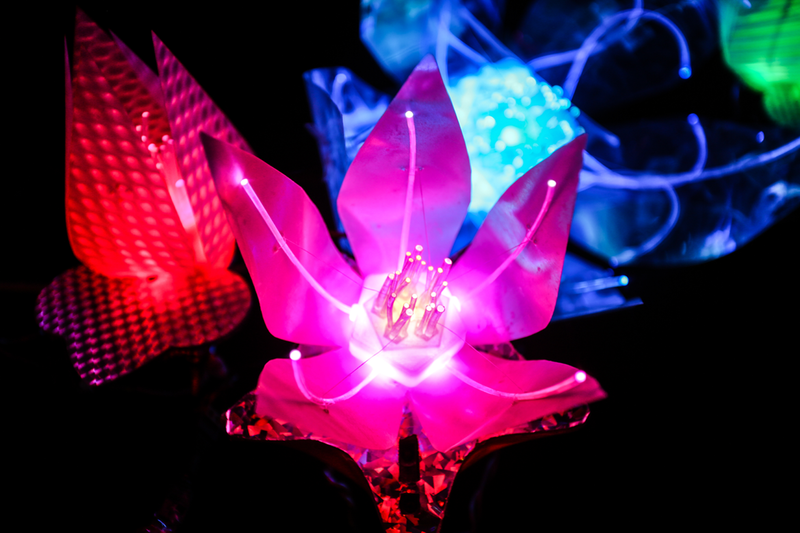 Small, Medium, and Micro-size interactive robotic flowers. 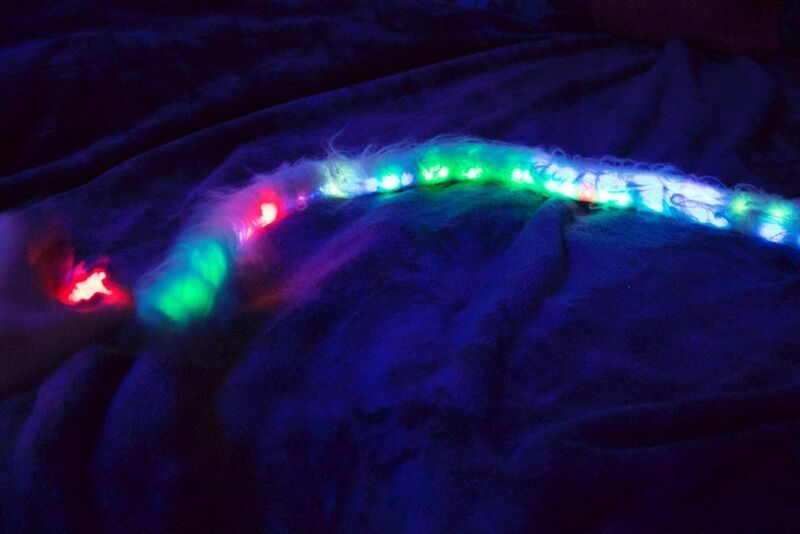 Collaboration with Mikaela Holmes. 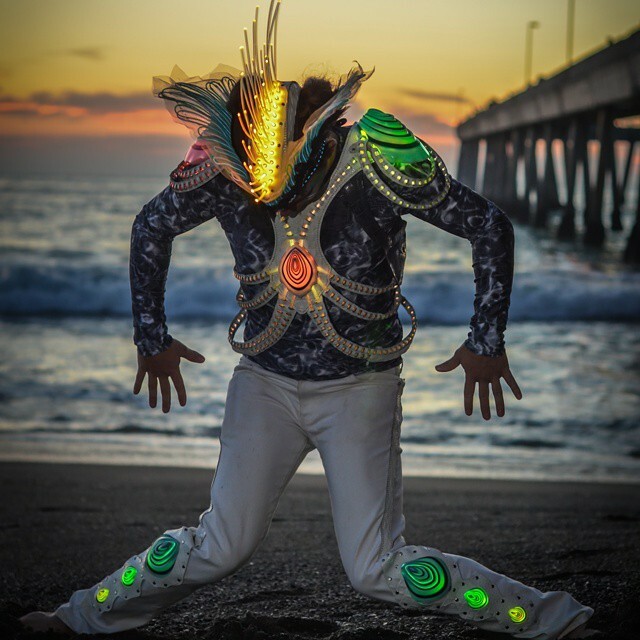 Three-piece costume designed by Mikaela Holmes for Andre Mistier of "The Adversary" band. 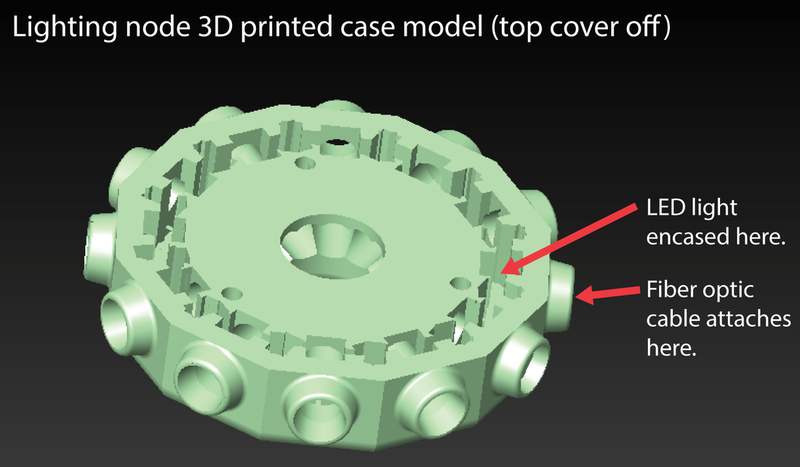 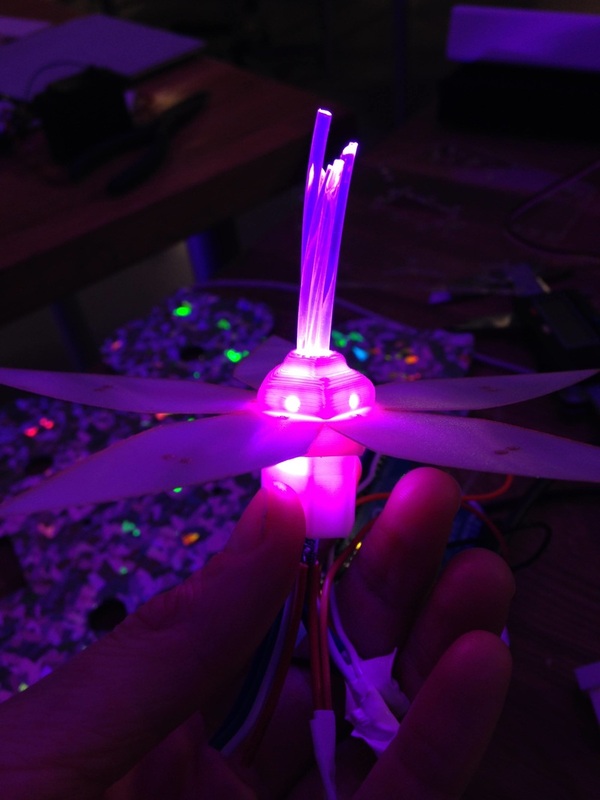 Incorporates laser-cut leather, 3D printing, LEDs, micro-controllers, and el-wire. 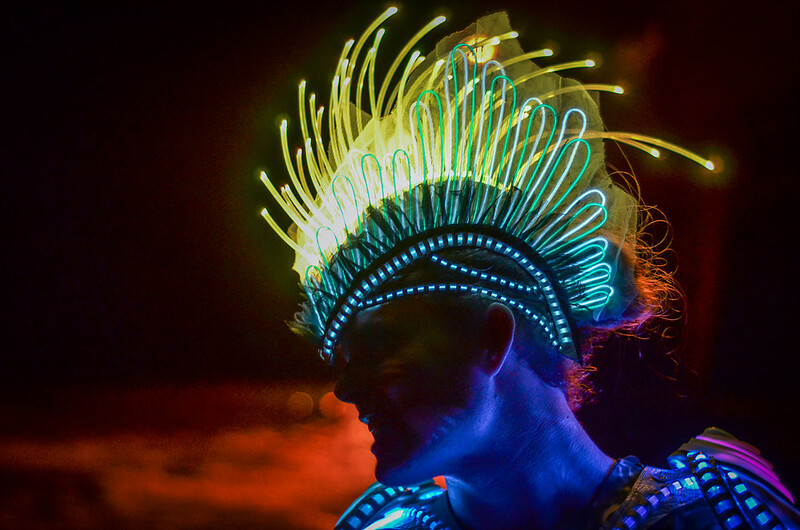 Responsible for lighting design and programming, and design and fabrication of 3D printed fiber optic-LED mating components. 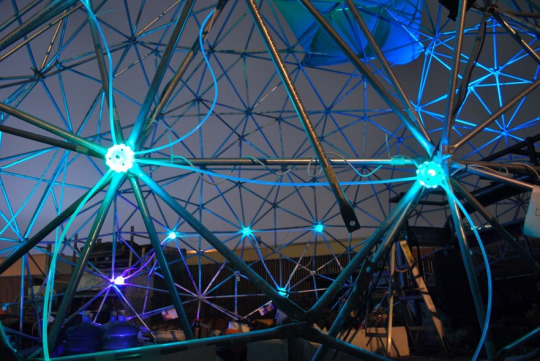 Designed laser-cut and coroplast lighting cover system to diffuse and protect LED strip that covered climbable steel bars. 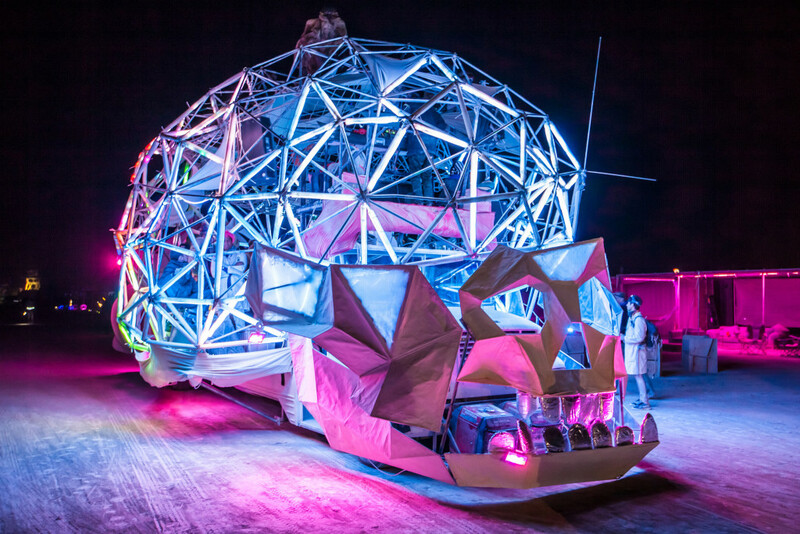 Created 3D printed "neuronal" lighting nodes that held LEDs and fiber optic strands together and were mounted all over giant brain-shaped jungle gym art car for Burning Man 2014. 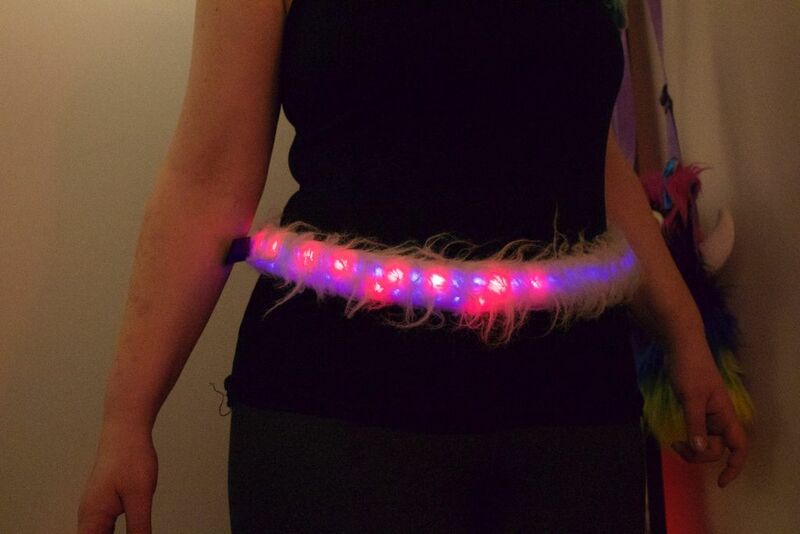 Arduino-based LED belt with microphone and gyroscope that changes colors based on sound and movement of the wearer. 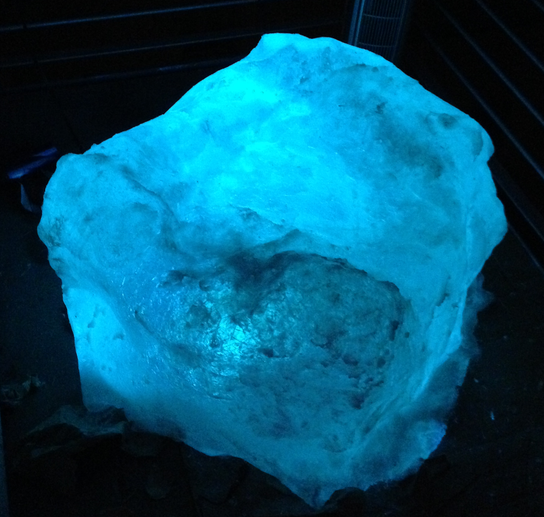 Light-weight LED panels created with 200 programmable LEDs, polycarbonate, and faux fur. 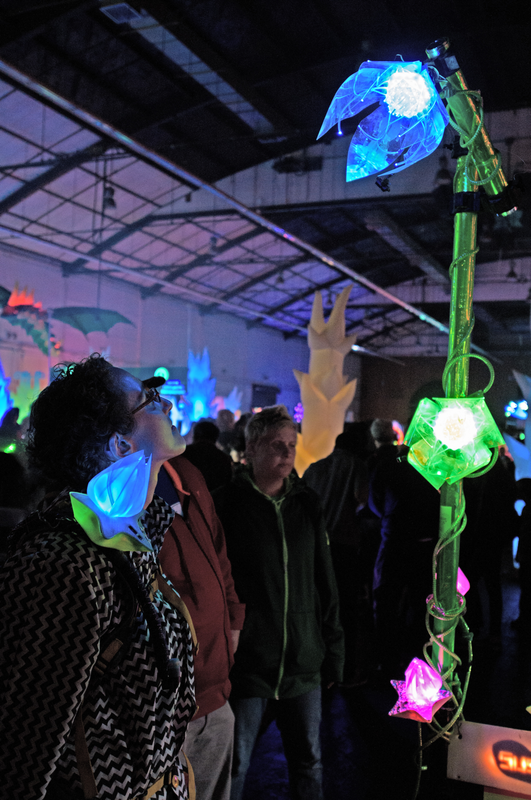 Fluorescent flowers, leaves, vines, and garden creatures constructed out of a mixture of materials including re-used plastic water bottles, vinyl, rexlace, pipecleaners, zip ties, pompoms, and UV LEDs. 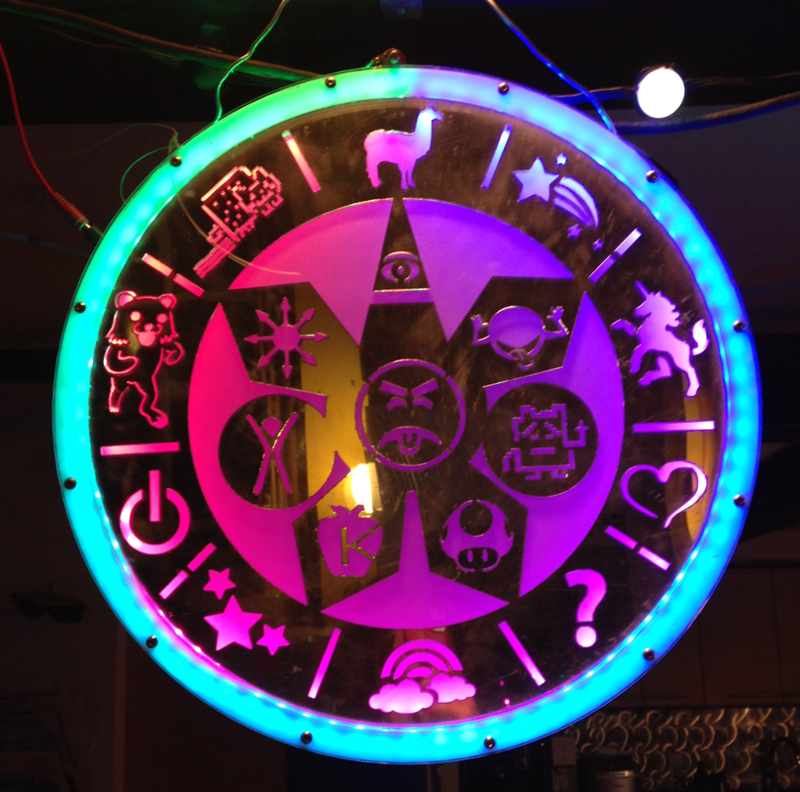 A creative merging of the Mayan calendar, Discordian/Illuminati themes, and internet memes. 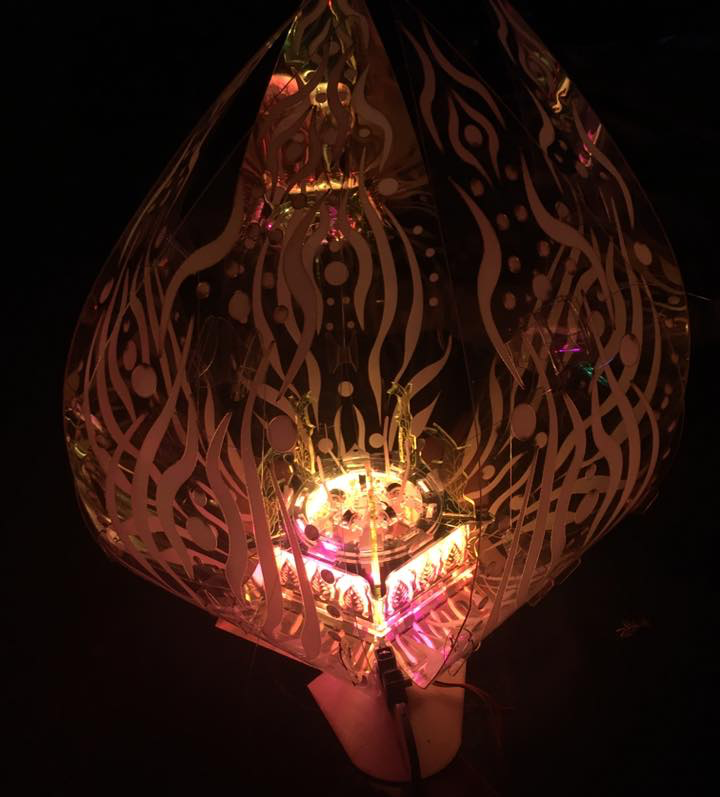 Created with laser-cut plastic and plywood, programmable RGB LEDs, Arduino, semi-translucent white vellum, and aluminum wire. 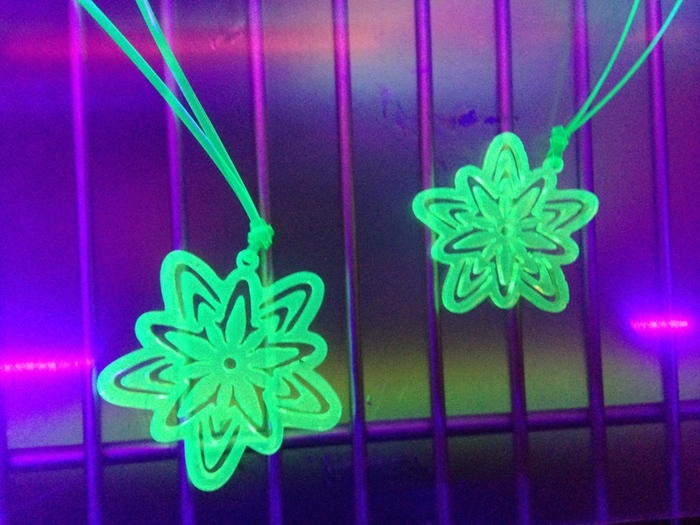 Laser-cut fluorescent acrylic pendants created for backs of my jointly-run Kickstarter campaign, the Magic Box. 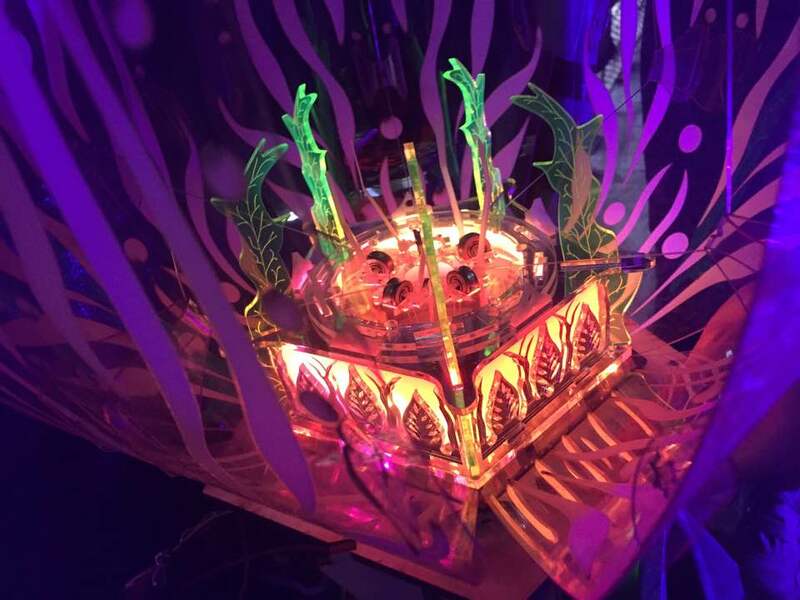 This work by Ashley Newton is licensed under a Creative Commons Attribution-NonCommercial-ShareAlike 4.0 International License.